Traditional office space is so passé. Forward-thinking workers and business owners are turning their attention to new and exciting work spaces that encourage productivity and creativity, and don’t bust a hole in the budget. Here are a few exciting office ideas for business owners and entrepreneurs to consider. 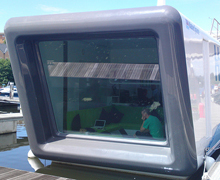 For marine-related businesses or just for those who appreciate working in a scenic environment on the water, a UK-based company called H20ffice is creating floating office spaces for use at marinas. A floating office might prove to be an excellent marketing tool for your business – the large sides and roof make for excellent branding opportunities. It also alleviates the feeling of being cramped up in a stuffy office, with an enormous picture window that keeps you from feeling enclosed. When the weather permits, the top of the office makes for a perfect meeting location or rest area. Self-storage companies offer more than just a place to keep your clutter. 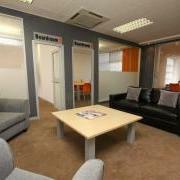 Some offer flexible office rental services, with rates dependent on the size of the desired office unit. Without long-term lease or set-up costs, these are an ideal solution for new business owners. Mobile offices are perfect choices for those who need to move around. For example, a mobile office is ideal if you’re in the construction industry and need office space at project sites. Mobile work spaces may also be used as temporary classrooms or healthcare centres in rural areas. Companies that offer mobile trailer offices also often offer communication and furnishing options for their trailers, making them a convenient choice. Subterranean offices exist in many metropolitan cities around the world. 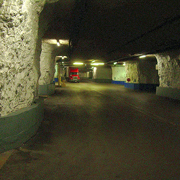 The largest of all is a complex called SubTropolis, which is located under Kansas City. Lying 100 feet below ground, it offers not only an alternative to traditional office spaces, but a creative solution to the growing problem of global warming. Because the offices are underground, they have a comfortable and near-constant ambient temperature. With no need for air conditioning, they use approximately 85% less power than offices above ground level. Some companies that lease space in SubTropolis are also considering installing wind-turbines and solar panels to further reduce their carbon footprint. A hotel has come up with a smart way to make money from vacant rooms. Instead of letting them lie dormant, the Marriott group has started leasing rooms out, giving business customers access to a work space with Wi-Fi, snacks, a power outlet and desk, with add-ons like parking and prepared meals. These rooms also serve as ideal spaces for hosting business meetings and conferences on-the-fly.